Before I fall asleep each night I watch a documentary from You Tube or elsewhere. Generally I put on something related to history, but I do not limit myself to any particular area, theme, or time period. Last night I watched “Secret Lives of Jesus Christ: King of Kings and Lord of Lords.” The documentary centers around “lost documents,” which painted a very different picture of Jesus as we know him in the New Testament. A long, long time ago, Christians monks stashed away some documents near a cave in Egypt. 1,600 years after their stashing, an Egyptian farmer found these documents, which were written in the Coptic language. Radio carbon dating places these documents between the 3rd and 4th centuries. Scholars do not dispute their authenticity. In these documents – known as the “Lost Gospels” – Jesus is more of a philosopher and revealer of knowledge and not a traditional rabbi as he is sometimes depicted in the New Testament. One of the “Lost Gospels” is the Infancy Gospel of James, which rewrites the story of the birth of Jesus. According to James, Jesus was born in a cave, not a barn. Jesus’ father, Joseph, was also a frail old man who had several children from another wife. The Infancy Gospel of James, moreover, suggests that Jesus literally walks to Mary immediately after his birth. Whether or not this is true is irrelevant. This particular Infancy Gospel tried to portray Jesus’ immense power even at the time of his birth. Another Gospel unearthed in Egypt in 1896 claims the Jesus’ closest disciple was a woman, Mary Magdalene. The Gospel of Mary claims that Jesus had an intimate relationship with her. The Lost Gospel of Judas, on the other hand, portrays Judas, the disciple who has been blamed for the death of Jesus, not as a villain, but as a hero for handing over Jesus to the authorities. 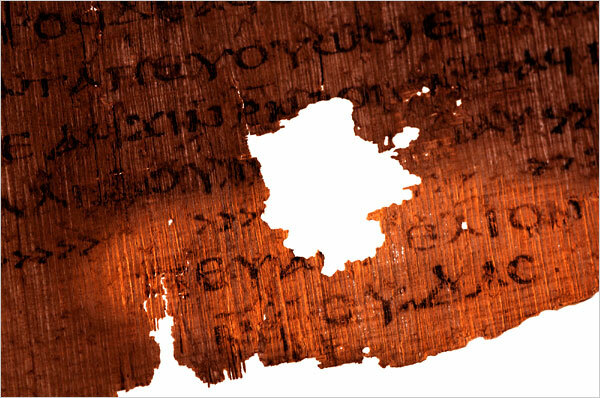 Every text of the “Lost Gospels” is packed with new information about the life of Jesus. The Infancy Gospel of Thomas shows Jesus as an immature child wielding immense powers. One story has Jesus playing on the sabbath. On a river bank, Jesus starts forming sparrows out of the mud. An angry Jewish man interrupts him because he was doing something which is forbidden – playing on the sabbath day. The man runs off and grabs Jesus’ father, Joseph, who also shows anger. Jesus responds to them both by clapping his hands, at which point his clay sparrows came to life and flew away. This story shows that Jesus is able to create life. Moreover, the mud story foreshadows Jesus’ disruption of the sabbath later in his life. The Infancy Gospel of Thomas also depicts the child Jesus as an angry and even violent boy. In one story, Jesus cripples a boy who criticizes him for violating the sabbath. Another story explains how a child accidentally bumps into Jesus’ shoulder one day. The boy is then struck by Jesus and dies upon falling to the ground. Scholars claims that this darker portrayal of Jesus might have been an attempt to show his infinite powers. At least three times in the Infancy Gospel of Thomas does Jesus raise the dead. One story has Jesus’ friend falling from the roof of a home, at which point the parents and friends of the boy accuse Jesus – “the trouble maker” – of throwing his friend down to his death. Angry at the accusation, Jesus calls out the name of the boy, who then rises up from the ground to say “No Lord, you have raised me up.” In theory, Jesus raises the dead boy so he could tell everyone the truth. Another story of the Infancy Gospel of Thomas explains an event between Jesus and a grieving mother who holds her dead infant baby. When Jesus sees her weeping, he goes to the child and touches its stomach and says “Live and be with your mother.” The child comes back to life and Jesus tells the mother to “remember him.” At this point, Jesus is slowly learning that he could also do good with his powers. Perhaps the most magnificent story of the “Lost Gospels” deals with Jesus’ journey away from Judea. In 1887 in northern India, the life of Jesus took an extraordinary turn. A Russian writer traveling in northern India fell of his horse and broke his foot, at which point Buddhist monks recovered him and brought him back to safety. The monks told the writer of ancient texts about a philosopher named Issa, which is another way of saying Jesus in several Eastern languages. The guide of the Russian writer translated the text and found that the saint was actually Jesus and that the texts are actually an account of Jesus’ “missing years.” According to the Russian writer, Jesus spends 6 years living in the Himalaya. According to some scholars, Jesus might have learned about mysticism among the Buddhist monks. However, according to the Buddhist text, Jesus eventually disobeyed his mentors by preaching to the poor, which was forbidden in that society. The monks tried to capture Jesus, at which point he fled. The Russian writer’s thoughts about this Lost Gospel is published in the book The Unknown Life of Jesus Christ. The historical record of Jesus is still incomplete and may always be incomplete. Clearly, there was a lot of confusion in the Middle East and beyond after his death, as many people tried to figure out who he was exactly. Was he simply a man? Was he from this Universe or another? Perhaps the Lost Gospels simply reflect the chaos of the early Christian Church. We may never know what is true or false, but we can certainly imagine what could have been if these “Lost Gospels” were included in the New Testament. There are more stories in this documentary which I did not cover. I do not want to spoil the entire video, so please have a look for yourself.